deposit- pup $250.00 which will be applied to your purchase price of your pup. Deposits are non refundable after 24 hours, but gladly transferred to another litter within a 2 year period. if notice is given within 2 weeks of the "home"date for your initial pup adoption. We welcome any and all questions that you may have about our dogs or contract options. -Purebred GSD status of your new companion. -Registered names and numbers of your companion and it's parents. for the future generations of humans to enjoy and breed. 2. 6 weeks Pet Insurance - no charge health insurance with adoptions under 22 weeks of age. -$ 150 for advertising and reward if your pup is lost or stolen. -NuVet vitamins- 2 week supply to get your pup started on a life of great Health. Imodium & Albon for your pups first few days home, to help it adjust without health issues. -DVD with 5 or more generations of your Pups pedigree, in full color. Full color DVD with training videos to help you learn the techniques to train your dog to perfection. We are always glad to provide DVD upgraded videos of Obedience all the way to OTCH. -A total $ 1,150.00 worth of coverage at no charge to the new owners. - Premium Dog Food kits that with food for your puppies first few days. life for your canine understanding training, feeding, vet and general health needs. - raised with hands on, touch therapy, for better human animal bond development. Example of the Professional Approach we take to making your adoption process perfect ! This is a Health form that will accompany each pup that leaves our home. - USA Kinderplay Training Classes Included up to 6 months of age with B & C contracts. -BOTH-Re homing life long for Appleridge dogs in need, on a case by case basis. -3 Unique Contracts available to acquire a Appleridge puppy. Long Distance Adoptions are a fact of life and we gladly provide you with references to make your adoption process delightful and successful. if you can reserve one of our very special puppies or dogs. A minimum deposit of $250 is required. 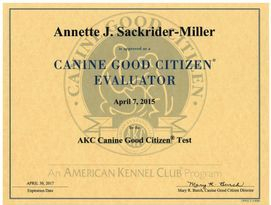 ALL ADOPTIONS MUST BE APPROVED BY ANNETTE SACKRIDER. If your application is not approved, your deposit will be refunded. All approved deposits are transferable to another litter within a two year period, if a litter does not merit a suitable matching pup for you, or your situation changes requiring the adoption process to be delayed. address and phone #'s, so that your application and deposit can be matched. $350 shipping, plus crate, in North America by plane to most International Airports services by United Pet Safe Program. documentation plus delivery to Atlanta included. Additional charges may apply if indicated by airlines for flight requirements. Crates for babies are $75 and will help you train your baby for the first weeks at home. contact to make deposit arrangements too. Pet Puppy Adoption-Flying - puppies 8-12 weeks of age - Confirmed approved adoptions, please! Crate, delivery to airport, flight paperwork, international vet paperwork, flight cost plus taxes all organized by us professionally for you. Pick pups will be delivered for breeding dogs to protect the quality of the breed. 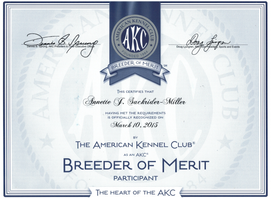 It is our responsibility and duty as breeders to always consider that will will impact future generations through our actions and choices of breeding dogs. Professional Deluxe Contract-Puppy Adoption- Delivered by air via London International or Chattanooga International Airports to your Airport for your convenience. Tax, crate, microchip, international vet documentation, delivery to airport, bathed, paperwork and reservation taken care of for you. Puppies - Flying - World Wide Shipping - Please be advise that deliveries by Air included within these contracts allow for North America flights only. There will be an additional surcharge for International travel based on quotes for flight and restrictions imposed by Country of receipt. All adoptions that require flights will need to have Delivered by air via London International or Chattanooga International Airports to your Airport for your convenience. Tax, crate, microchip, international vet documentation, delivery to airport, bathed, paperwork and reservation taken care of for you. documentation completed, 5 days in advance of the flight. We ship via Air Canada or Northwest Air, unless otherwise requested by the Adoptive family. Flights are gladly arranged by us. Deliver is now part of our packages as Airlines no longer accept COD. 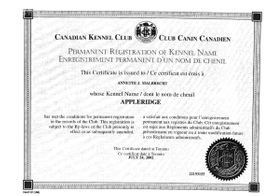 Appleridge will gladly have pups health flight documentation completed through our Vet, 5 days prior to the flight, at our expense. As of January 2008 we will no longer fly GSD Rescue or Adult dogs, alone. One must attend the facility for these adoptions. We thank you for your understanding in this matter, as older dogs, each, have unique needs and therefore adoptions are more successful in person. Air Canada - London International Airport, London Ontario, Canada 519-451-3251.